It's unclear whether H. nebulosus has yet appeared in the trade. Habitat of the species near Maradong, Sarawak, Malaysian Borneo. Homalopteroides: From the ancient Greek εἶδος, ‎eîdos (= form, likeness, resemblance) and the generic Homaloptera. nebulosus: Latin, meaning cloudy, dark, foggy. Described from the Sok River, Kelanatan state, northern Peninsular Malaysia, and since recorded from both Malaysian and Indonesian parts of Borneo as well as the Natuna Islands off Borneo’s western tip. Little information is available but presumably inhabits swiftly-flowing streams and headwaters containing clear, oxygen-saturated water. Given it shares some morphological characters with H. tweediei (see ‘Notes’) there’s a good chance it may prefer moderately-flowing stretches with patches of submerged vegetation. At the Air Terjun Sekayu waterfalls in Terengganu state, Peninsular Malaysia the water was described as ‘clear and fast-flowing over a rocky substratum’, and H. nebulosa was observed alongside Garra cambodgiensis, Neolissochilus soroides, Poropuntius smedleyi, ‘Puntius‘ binotatus, Homaloptera parclitella and Amblyceps mangois. 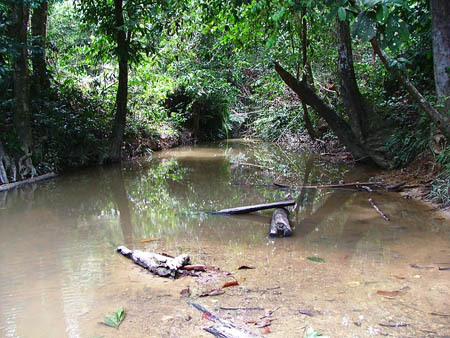 In the Kahang River, part of the Endau drainage, it’s been recorded alongside Homaloptera zollingeri, H. parclitella, H. ogilviei and Homalopteroides tweediei as well as Malayochela maassi, Crossocheilus langei, Cyclocheilichthys apogon, Mystacoleucus marginatus, Rasbora dusonensis, R. elegans, R. paucisqualis, Trigonopoma gracile, ‘Puntius‘ partipentazona, Nemacheilus masyae, N. selangoricus, Neohomaloptera johorensis, Acanthopsoides molobrion, Pangio cuneovirgata, P. doriae, P. kuhlii, P. malayana, P. piperata, P. shelfordii, Pseudomystus fuscus, Akysis microps, A. hendricksoni, and an unidentified species of Glyptothorax. The largest officially-recorded specimen measured 35.9 mm. Driftwood roots and branches are also suitable and aquatic plants from genera such as Microsorum, Crinum and Anubias spp. can also be added. The latter are particularly useful as Homalopteroides spp. appear to enjoy resting on their leaves. Since it requires stable water conditions and feeds on biofilm this species should never be added to a biologically immature set-up. It’s found living in aggregations in nature so buy six or more to see it at its best as when kept singly, in pairs or trios it’s less bold. The interaction between individuals is also interesting to watch. This species is poorly-known in the aquarium hobby and may never have been exported for the ornamental trade. Following Alfred (1969) H. nebulosus can be told apart from congeners by the following combination of characters: 36-40 lateral line scales; 4-5 simple and 9-10 branched pectoral-fin rays; a dark brown stripe along the lateral line with 5-6 irregular brown markings on the dorsal surface and flanks. As in H. tweediei the eyes are placed in a comparatively raised position on the head and the two share similar fin ray counts, but H. nebulosa has more lateral line scales. The genus Homalopteroides was revalidated by Randall and Page (2012) on the basis of its unique mouth morphology, and is told apart from the related Homaloptera by the following combination of characters: dorsal-fin origin above pelvic-fin; ≤ 60 lateral-line scales; ≤ 30 predorsal scales; oral morphology consisting of two thin and widely separated rostral barbels on each side of the mouth, thin crescent-shaped lips, the absence of any structure such as a mental pad or lobes between the lateral portions of the lower lip, and a chin that extends anterior to the lateral portions of the lower lip. Homalopteroides currently (February 2016) contains H. wassinkii, H. modestus, H. nebulosus, H. rupicola, H. smithi, H. tweediei, H. stephensoni, H. indochinensis, H. weberi, H. yuwonoi, H. avii and possibly H. manipurensis. These are all former members of Homaloptera, a polyphyletic grouping which following Randall and Page (2015) was split into the genera Homaloptera, Homalopterula, Pseudohomaloptera, Homalopteroides, Balitoropsis, and Ghatsa. Homalopteroides spp. 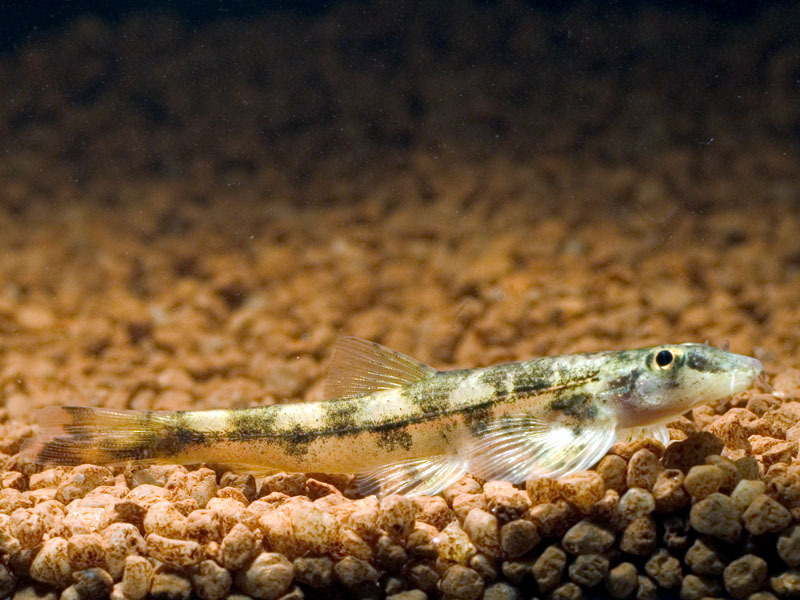 are sometimes referred to as ‘lizard’ or ‘gecko’ loaches due to their behaviour and appearance. Like all balitorids they have morphology specialised for life in fast-flowing water, i.e., the paired fins are orientated and extended horizontally, head and body flattened, belly depressed.